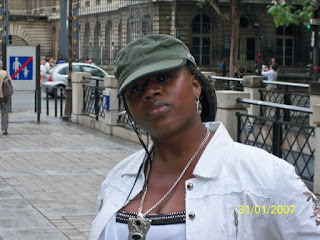 AFRICAN WOMEN IN CINEMA BLOG: Éléonore Yameogo talks about her film "Paris My Paradise"
Éléonore Yameogo from Burkina Faso talks about her film Paris mon paradis/Paris My Paradise and the phenomenon of the dream of a better life in the West experienced by so many who hope to reach its territories. Éléonore, you also had illusions about Paris before arriving. What was the inspiration for your film, Paris mon paradis? The inspiration for my film Paris mon paradis came from the film La noire de... by Sembene Ousmane from Senegal. Released in 1966, the film is an adaptation of a short story drawn from his work Voltaïque. La noire de... is the first feature film by a black African filmmaker. It is the story of a young Senegalese woman hired as a governess by a white family living in Dakar. Her employer decides to return to live in France enticing the Senegalese woman to follow her. I was very touched by this film because like Diouana, the protagonist of the film, I had a similar dream and encountered another reality upon my arrival in France, a total disillusionment of my vision of the West. In contrast to Sembene, I wanted to treat the subject in the form of a documentary in order to depict the reality hidden behind the western myth. The destitution in which a number of clandestine immigrants live is well known since it is often reported in the media. While still in Burkina Faso had you heard about these conditions? Did you talk with compatriots who had returned from France? The plight of immigrants in the West is not often publicized in Africa because it would diminish the interest of future immigrants. African states are struggling to find employment for its youth even those with diplomas. It is not in their interest to discourage or prevent those who decide to set off for the West. Some regions in Africa have developed as a result of their expatriate nationals, for instance, the region of Kayes in Mali. In Burkina Faso the subject of immigration has never been an open discussion. Contrary to countries such as Mali, Senegal, or Côte d'Ivoire, Burkina Faso has a low immigration rate in the West. According to statistics, there are more French in Burkina Faso than Burkinabé in France. The tendency of not revealing the truth to families in Africa seems to contribute to the precarious existence of your interlocutors. In your opinion, why is this sense of pride so profound that it drives them to live in destitution rather than return to their country to receive at least minimally a means to live and the support of their family? In Africa, we accord a great deal of importance to the judgement of neighbors and others. I think it is one of the major factors that prevent immigrants from returning home in the case of failure. Because they lie to their family about their precarious situation, some are compelled to send monthly contributions to their families. I think that feelings of obligation to support their families is an enormous burden that immigrants carry on a daily basis, in spite of their difficult situation. In your research on the subject, did you find it more difficult for women than men to live in a perpetual state of itinerancy and instability? During my research on the subject, I realized that there are fewer women living in the streets or in squats than men. In general, many immigrant women in France have been granted family reunification status and come to join husbands who are already settled there. Of course there are women living in itinerant and unstable situations. But in order to flee the streets, they prefer to use their charm to be able to have a place to live. In an example of one of the participants of my film, in return for rent some women are compelled to exchange their bodies, and are often subjected to sexual violence. How did you choose the participants of the film? What was the situation of those who were not included in the film? The choice of participants of my film was based on the accounts of their misfortunes in France that I was able to collect during the preparatory stages. I opted for a diversity of participants, whether Burkinabé, Malian, Guinean, Senegalese, they are all Africans going through the same hardships. The main participants are Bintou, a young 26-year-old Burkinabé woman, Saaba, a 40-year-old man from Senegal, and Amoro, a 65-year-old Malian man. The behavior of certain participants in the film is not very flattering. Some made poor choices that add to their precariousness and do not solicit empathy. Why did you choose to approach the subject in this way? If one hides these unpleasant aspects, showing only a part of the truth, there is no point in making the film. It is not because they are in a very fragile position that this aspect of reality should not be revealed. They are like everyone else with their share of strengths and weaknesses that they deal with, and they also resort to other schemes. Human truth is complex and there is a tendency to oversimplify: either victim or victimizer. I want the film to speak about people without reducing them to only one aspect, either positive or negative. Why the choice to show only the misery of clandestine immigrants when there are those who earn their living with dignity and have a certain level of happiness? My film focuses on the fragility of certain immigrants in France. I chose to deal with this category of immigrants because those who succeed are not in the shadows and do not hesitate to talk about it. From the perspective of Africa, the success of an expatriate appears self-evidence, and yet when one examines certain neighborhoods in Paris, the reality is different. Hard times are written on their faces. Problems with housing, unemployment, the lose of one's bearings, typify the daily existence of a good number of African expatriates, especially those living clandestinely. With this film I would like to pay homage to the thousands of men and women who are doing their best to live in French society, and to shed light on the situation so that those hoping do the same may use the film as a document to better prepare their voyage. With increasing attention on the issue of immigration globally the film adds a perspective on a phenomenon that will only grow. In France, it is not only Africans who live precariously as clandestine immigrants, the recent focus on the deportation of the Romani is another example. In the United States, Mexicans and other immigrants from Central America have similar histories. Even in Africa, with instability in certain regions, thousands of Africans leave to find work in less hostile environments in neighboring countries. Several years ago in South Africa, xenophobia towards immigrants had rather violent results, as certain South Africans accused them of being lazy and wanting to take their jobs. Would you like to see your film as part of a larger discourse on immigration and its perceptions and attitudes in a world increasingly interdependent? Paris mon paradis does not respond directly to questions of racism, which immigrants of color face everywhere, but rather, it gives a better understanding of the plight of immigrants and therefore, necessarily, contributes to greater tolerance. The film speaks about the phenomenon of Africans in France and in particular in Paris, but of course the situation exists in all regions of the world. The phenomenon of the dream is always in the direction of countries from the South towards the West. To begin to understand that it is an illusion may be the first step towards an era where things will reverse. People will want to go from the West to the South.